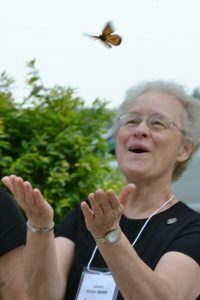 The School Sisters of Notre Dame have a way of proceeding in their community living and ministries that is reflective, prayerful, dialogic and discerning. In our Inspirational Reflections section, we share some of our many ways of discerning God at work in everything. From sisters and SSND associates, we present artwork, poems, book and movie reviews, banners or quilts, vignettes, musical compositions, photographs and other inspirational creations through which they reflect and pray. Click below to view some of our reflections. Please check back for new inspirations. What inspires you? If you have a reflection that you would like to share, please send it, along with your name and contact information, to, communications@ssnd.org.